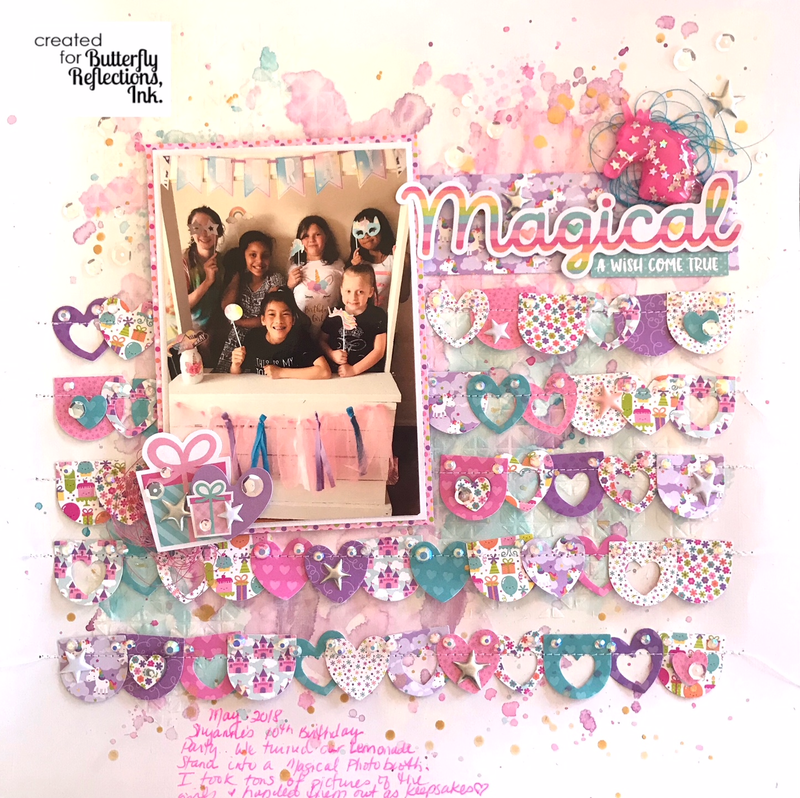 Hi, crafty friends....Heather here to share a "magical" scrapbook layout featuring Doodlebug Designs "Fairy Tales" collection and Reverse Confetti die set. The picture is of my daughter and her friends at her 10th birthday unicorn party. My husband built a lemonade stand last summer and we turned it into a photo booth for her and her friends to have fun with. So, when I saw this collection, I knew it would be perfect for my photos from the party! I started with a piece of white cardstock and created a messy mixed media background using Distress Oxide Inks. 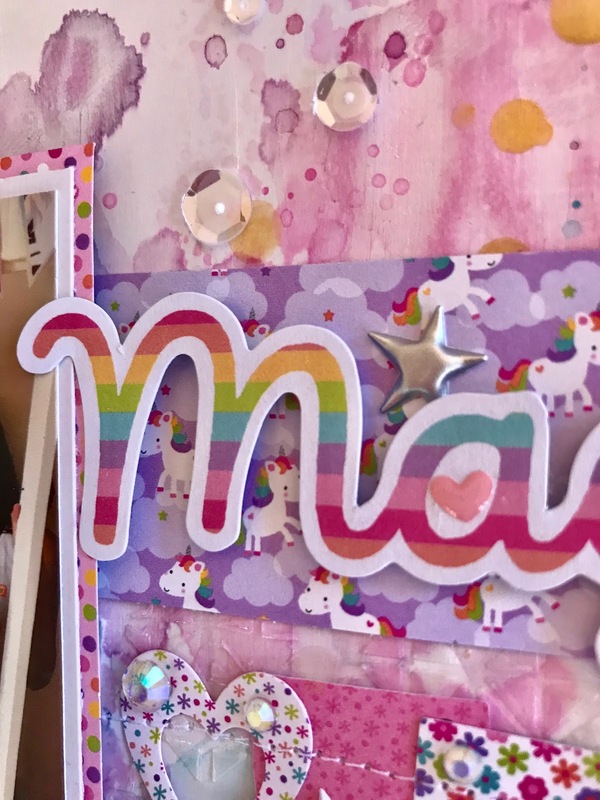 This tried and true technique is so simple and easy, it is definitely my go to when I use white cardstock. I used Picked Raspberry, Broken China, and Seedless Preserves. These colors match Doodlebug patterns so well!. To create some texture, I used a stencil from Echo Park called Geometric Heart and texture paste from Dreamweavers. This texture paste is one of my favorites because it is translucent. Which means it dries clear and picks up the color beneath it. It is a subtle detail, but adds just enough texture behind my main design elements. 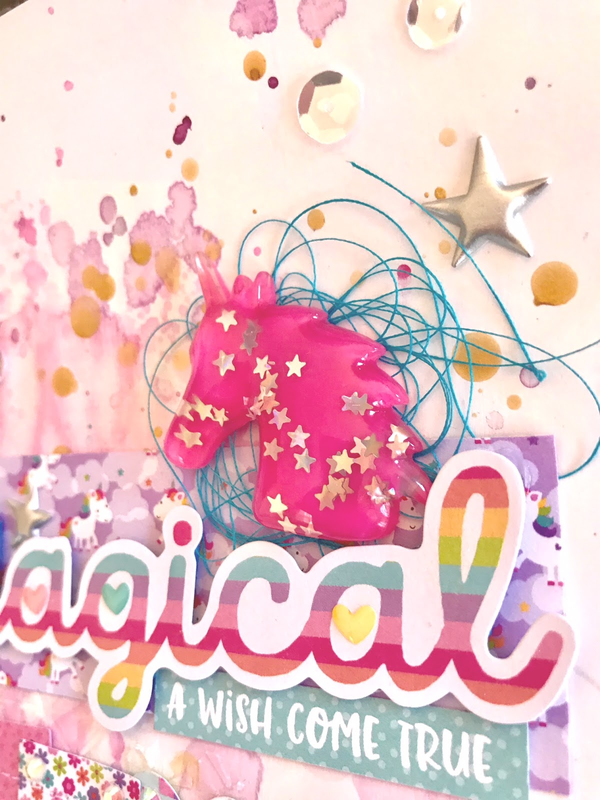 The idea of making banners popped in my head after I opened the Odds & Ends pack of embellishments. 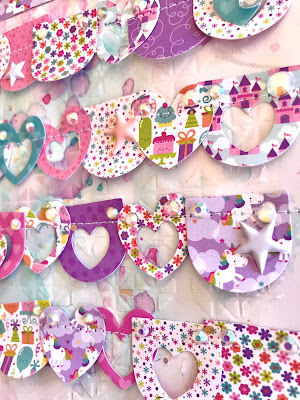 There are a few banner die cuts included, but I wanted to create several banners and thought the Heart Banner Confetti Cuts die set from Reverse Confetti was perfect! They are so cute and versatile! They can be stacked together or used alone which is what I did....a couple of the dies also cut little hearts in the center which allows the color on my background to peek through! I cut about four dozen of the banner pieces from the Fairy Tales 6x6 paper pad. After arranging the die cuts in every possible way, I decided on (4) rows just straight across and temporarily with adhesive so I could stitch them down with my sewing machine. I liked the idea of bending the up the banners for dimension. I added an iridescent crystal from Studio Katia to each tiny hole on either side of the banner die cuts which act as sort of the "pins" holding my banners up. Plus, they are so sparkly! For my title, I pulled one of the large word die cuts from the same Odds & Ends embellishment pack and placed one of the phrases underneath from one of the cut apart papers from the 6 x 6 paper pad. 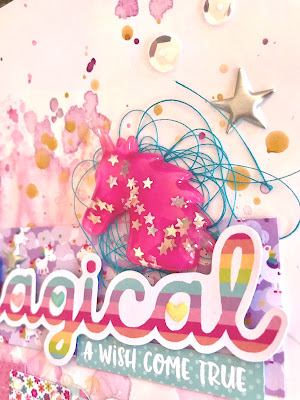 I really wanted to use one on the cute paper clips from Shimelle Glitter Girl but they didn't fit right due to the direction the unicorns were facing in, so, I took a breath, and pulled the paper clip off! I know...very scary, but it came off easy enough and then I was able to place the unicorn over my title on top of a bed of blue thread from my stash. To finish up, I added clear sequins from Pretty Pink Posh and Bella Blvd puffy stars and Freckled Fawn scattered about the page. For even more sparkle....I broke out my Nuvo shimmer pen and went shimmer crazy! on my title, die cut hearts, presents...can't have enough sparkly goodness when they are unicorns involved! 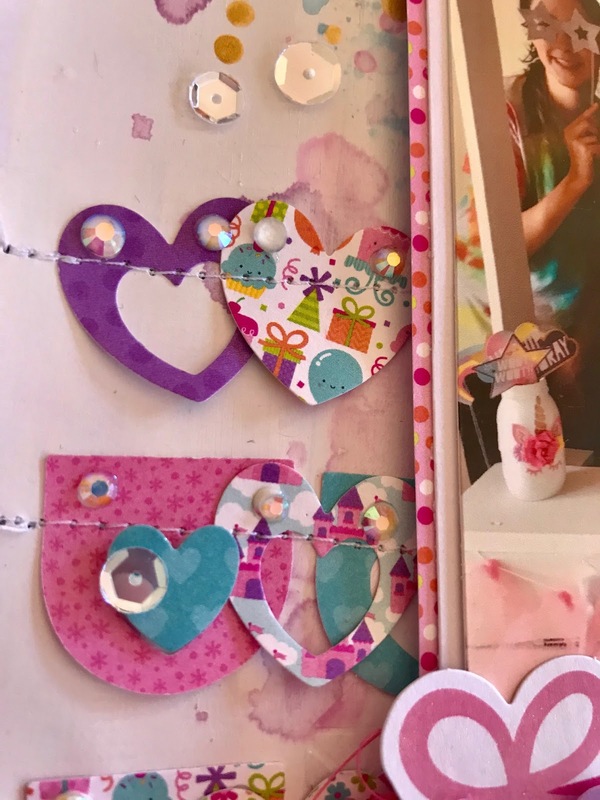 Thanks so much for stopping by...I hope you like what you see and are inspired to pull out a die set to make your own embellishments! Head over to the online store and take a look at what Reverse Confetti has to offer and pick up some of the adorable Fairy Tales Collection from Doodlebug Designs too! Please feel free to leave a comment or question...I'd love to know what you think!